Isle of Man-based V.Ships' announcement puts in jeopardy the entire Scottish Executive exercise. It announced it is withdrawing from the tender exercise for the Gourock to Dunoon route. BBC political correspondent Kit Fraser said the withdrawal could stall the whole exercise and lead to a rethink. The announcement comes after BBC Scotland reported the private sector's growing lack of confidence in the whole process. V.Ships is the world's biggest ship management company. 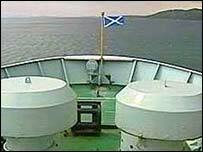 It recently lost out to Caledonian MacBrayne in bidding for the Orkney and Shetland ferry routes.